The exploration of nature in art can take endless forms, because nature provides us with such a vast wealth of inspiring phenomena. That gives us a lot to work with! Nature is both all around us and deep within us. We are inseparable from nature - our bodies, lives and minds depend on the air we breathe and the food we eat. The earth sustains our very life force. Without the earth - without nature - what would we be? So if you want to create a work of art based on the theme of "nature", you've really got a whole planetful of ideas to work from! Below you can see one of my colored pencil drawings, Cosmic Frog, followed by a brief description of the way this drawing addresses the subject of nature. This drawing is part of my Deep Thinkers series, in which various animals are juxtaposed with evidence of human thought, in the form of mathematical equations, quotes, definitions, musical scores, etc. These pieces approach the topic of nature in art by depicting a zen-like transcendent bridge between conceptual thinking and animalistic consciousness. These two contrasts are united by a careful use of color and decorative design. 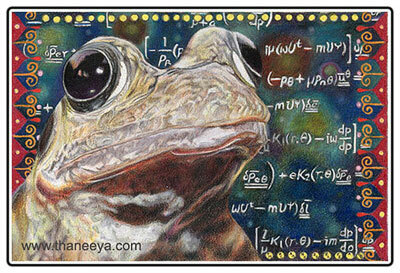 This piece depicts a frog in front of a series of black hole equations. This drawing depicts one way of approaching the topic of nature in art. My Cosmic Frog drawing ties together earthly, amphibious life with cosmic, universal calculations - thus combining something small and recognizable with grand concepts that are abstract and intangible to our human consciousness. Frogs and black holes - makes for an interesting contrast! 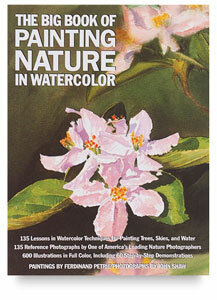 Nature in art can take many visual forms, from photorealism to abstraction. Art can mimic nature, by seeking to visually replicate objects as they actually appear in real life. But abstract paintings can also take their visual cue from actual forms in nature, such as the painting below. This piece arose from the study, observation, and contemplation of natural phenomena and natural forms. When sitting at the easel, I used creative liberties to assign bright colors to detailed patterns that were inspired by what I had seen in my natural surroundings. My painting below, Fulgent Life, is another example of nature in art. This painting was heavily influenced by my up-close observations of plants and insect life whilst living on an isolated hilltop in southern France. 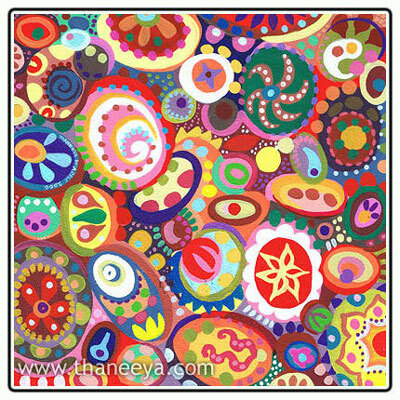 This painting depicts the elements of earth - rocks, stones, soil, minerals, and the things that live amongst them. This artwork was based on the forms that I observed in nature, which I used as a starting point to create an imaginative, abstract work of art. 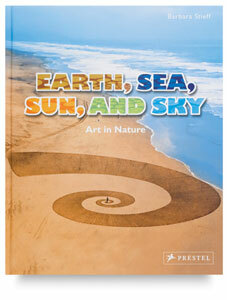 There are many different ways to approach the subject of nature in art. Art can open our eyes to the intricacy and beauty of the natural world. It can simply be a pretty picture that appreciates nature for what it is... or it can be a challenging piece expressing our complex human connection to nature. Art can serve a purpose beyond being an object of beauty: it can also address pressing environmental issues and topics about conservation, sustainability, preservation, biodiversity, and threatened habitats. Art has the ability to interact with and educate the viewer about these issues, spreading awareness about such important topics. We feel an instinctual need to take care of the things we feel connected to. Art can help renew, or spark anew, our connection with nature. Sustainable art is a movement whose aims are to ignite discussion (and adjust our perception) about the way we use our resources. Sustainable art seeks to make us think more deeply about the impact that our lifestyle choices have on the planet. Artists for Conservation is a group of artists who, in various ways, support nature through their artwork. They paint nature in art in the form of beautiful and idyllic images of animals and landscapes. In addition, they also donate a portion of their art sales to conservation efforts. Nature in Art is a British museum devoted entirely to artwork inspired by nature. They have an extensive collection of artwork covering a 1500 year time period, representing over 60 countries and cultures. In addition to their permanent collection, they have special exhibitions as well as classes and events for adults and children. In these hyperreal, digital times, it is easy to forget, and even resist, that we are susceptible to natural forces. Art can help us become more conscious of our true relationship with nature. It is undoubtedly important to feel a connection to the natural world... in fact, it is vital to our survival! The first step to creating art based on nature is to spend time in nature. So unplug yourself. Turn off the TV, radio, ipod, laptop. Go outside. Tune into your surroundings. Feel the wind upon your cheek. Observe the veins of a leaf, sit against the trunk of a tree, watch a river flow. Let your mind be as vast as the sky. 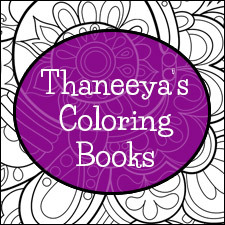 Bring a sketchbook and see what arises! These whimsical bird drawings depict a variety of birds in colorful scenarios, with the aim to expand our usual view of the creatures we meet in nature. Learn how to draw a puppy in this drawing lesson! This drawing tutorial shows you how to draw your own puppy drawings. Here's a fun tutorial on how to draw a cat! These are not ordinary cats though... these are Cosmic Cats! Check out the detailed pencil drawings of Doreen Cross. Realistic animal drawings are her specialty! 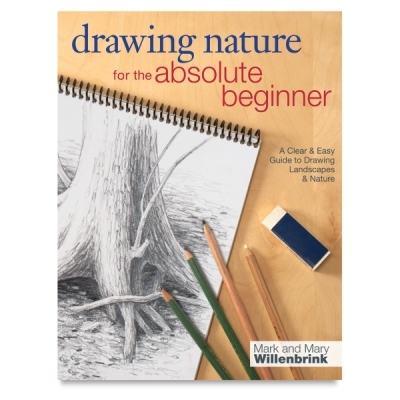 Are you interested in drawing animals? Visit my friend Ivan's fantastic site, where you can learn how to draw animals (and many other things also)! Check out these recommended books! If you make a purchase we get a small commission that supports this site!